Combine a few yards of fabric with a few hours of your time and you'll be ready to beat the summer heat in style! It's the perfect sewing project for a beginner. It consists of sewing two fabric rectangles together with an elastic casing at the dress top and at the waistline. I found the fabric, belt and even the bias tape used for the casing in a thrift store, so total investment for my "Island Dreams" maxi dress was less than $10. I call this my Island Dreams dress as it reminds me of hot weather, lush flowers and refreshing drinks served with little umbrellas. Here's how you can sew your own Island Dreams maxi dress (or swim suit cover-up if you prefer). 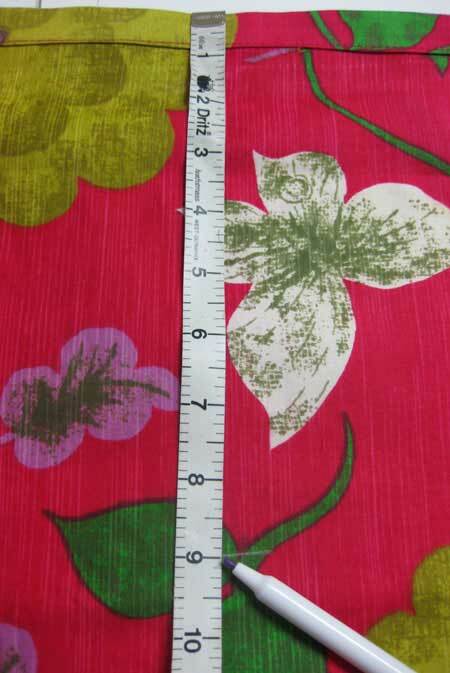 Lightweight woven fabric 45” wide - enough yardage to cut two dress lengths. You’ll determine the dress length in the next step. 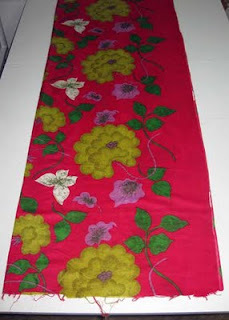 Choose a lightweight fabric as the width of the dress is about 64" when sewn. If you want less ease just cut your rectangles narrower. Measure from your underarm to the floor (or where you want your dress to end). 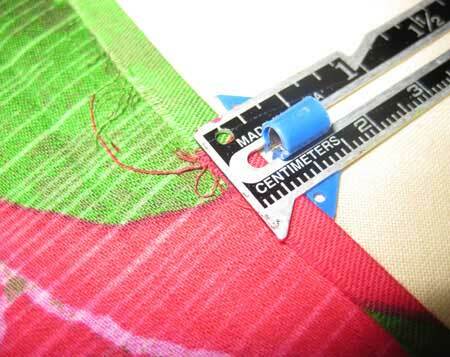 Add 3 inches to this measurement for upper casing and hem. This will be the length you cut each rectangle. I cut my dress 50” long. Lay your fabric on a large flat surface.I used my cutting table, but the floor works just as well. Cut two rectangles 33" wide by the length you determined in the step above. If you want a closer fitting dress this is where you'll want to cut a narrower rectangle. If you want a looser fit, cut the rectangle wider. With right sides together pin the two large rectangles together along the long edges,which are the side seams. Using a 1/2” seam allowance, stitch the side seams. 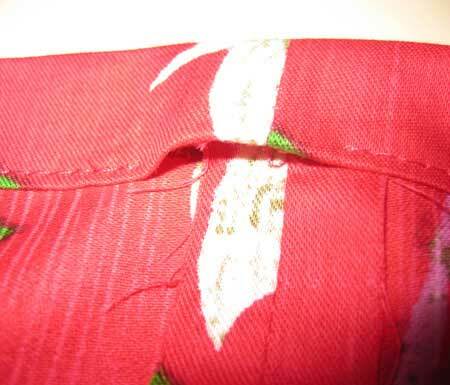 If desired, finish the seams with a serger, a zig zag stitch, or pinking shears. Some seam finish examples can be viewed here. Optional walking slits: If you want a walking slit, stop sewing the side seam about 18" from the lower edge on one or both sides. If you do that be sure to turn under and hem those raw edges! Turn under 1/4" on the top edge of the dress. Press. Turn under another 3/4" on the top edge. Press. This is the upper casing of the dress. Stitch close to pressed edge forming the casing. Leave a 1" opening to insert the elastic. Turn the dress so the wrong side of the fabric is facing out. From the top edge of the dress, measure down 9” and mark with chalk or pen. Continue measuring and marking 9” down from the top edge of the dress until you've drawn a solid line around the entire dress. This is the line for the waist casing. 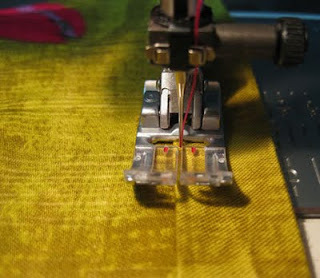 Starting at one side seam, place one edge of the seam binding along the line you just drew. Stitch close to both edges of the seam binding. Be sure to leave a 1" opening at one side seam to insert elastic. Place a safety pin on one end of the elastic and thread it through the upper casing. Don't forget to pin the other end of the elastic to the garment or you’ll lose the elastic in the casing when you begin to pull to thread the elastic through. Once the elastic is all the way through, secure the elastic to the dress by pinning both ends to the dress seam. Try the dress on to make sure the elastic is tight enough to hold the dress up. Adjust if necessary. Remove the pins, overlap the two edges of elastic, stitch together securely (you don't want that elastic to come undone while you're wearing the dress now do you?) and tuck into the casing. Sew the casing opening closed. 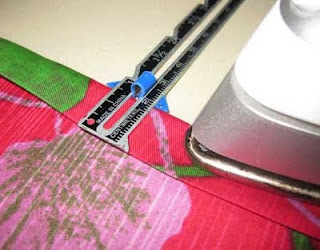 Cut a piece of 1/2" elastic that fits comfortably around your waist. 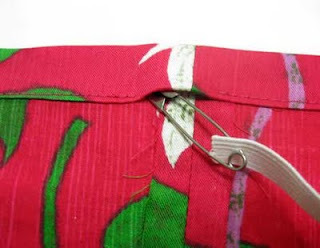 Place a safety pin on one end of the elastic and thread it through the waist casing you just created with the seam binding. Once again, don't forget to pin the other end of the elastic to the garment. Overlap the two edges of elastic, stitch together securely and tuck into the casing. The hem of the dress is created the same way as the upper casing. Turn under 1/4” on the bottom edge of the dress. Press. Turn under another 3/4” on the top edge. Press. Stitch close to the pressed edge. 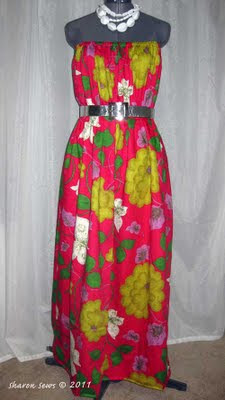 Add a belt, some great costume jewelry and go enjoy the compliments you'll get while wearing your new dress. a friend gave me the perfect fabric to try this with! Cool! What a great tutorial and dress. Love that fabric! Sharon this is perfect. Faye is hosting a Stay Cool sew along in which you make a dress and of course I am late getting started. I just came over here to find and print out your instructions for the goddess dress. This tutorial is fantastic! What an awesome tutorial! I never thought to use bias tape for the waist casing..... I will def have to try this! I am a beginner at sewing and have managed to make this dress, cant wait to wear it out, thank you so much for the upload. How pretty, and sew, sew simple! Sweet dress! And, if you have a big lunch, just release the belt! Very cute. I hope you have many happy evenings, sipping drinks with umbrellas while wearing this dress. It is lovely. What a great tutorial!!! Love the print! Love the dress! Beautiful tutorial!! Thanks for sharing! Great tutorial. Love the fabric..What a great deal. I love shopping my local thrift store. I find such wonderful vintage fabric there. ooooo, I really want to try this dress! What a great post! I just came across your blog and I fell in love with it! It's spectacular! I love your style! Check out my blog and follow if you like it, I promise to do the same! Pretty fabric, the colors and print look vintage. How come I never find fabric at my thrift stores? I love the maxi dresses, but I can't think of any occasion where I could wear one. Rats! I am new to sewing in have only been sewing since April and the terminology on patterns are so confusing. This looks easy enough to do and it is in simple words.. THANKS FOR SHARING. Thanks for the tutorial. I have some fabrics that just scream for this dress style. Love the fabric. sewing hint: put a safety pin in each end of the elastic, then if it gets loose you can find it again. LOve the fabric! Am plus size so patterna are limited, but this will work. Sewing hint: put a safety pin on each end of elastic so if it gets loose you can catch it. I love this. Can't wait to try it! ok so i never saw where you use the bias tape someone please help??? What super cute dress! How do you make it to fitmy size?? I very sorry if this is a silly question ?? GREAT! Thanks for explaining it so well. When I read the part introducing 392$ - 2010 La Sposa Latina Wedding Gown in your article, I felt that you were a kind-hearted person. Can you tell me where I can buy a 370$ - 2010 La Sposa Lauca Wedding Gown at a low price? I will be married soon. I 'm strongly for your opinions about this cheap Pronovias wedding dresses in your article. It seems that you know a lot about the Maggie Sottero wedding dresses. Are you willing to promote Pronovias wedding dresses? I can help you make money out of it. The profit of the cheap San Patrick wedding dresses I am selling is very high. You can make several hundred dollars in promoting one article. If you have interest, you can contact me. Not sure how I stumbled across you blog...esp at a time I was looking to see how I wanted to make this dress. I am now following you!!!! Thnx for the tutorial!!! I haven't got any dress fabric but I've got a couple of duvet covers that I don't use so I'll have a go with them before spending any money. I know you said the width of the drwss will be 64 inches. What size does this fit. I don't know how to figure if needed wider. Yay!!!! This dress is awesome! Great tutorial and I love the dress fabrics you used in this post. Anne Adams Dress - "Easy, Interesting"
Sharon Madsen c. 2006-2017. Simple theme. Powered by Blogger.